Think it's taboo to bring fish in lunch box? Well, we'd like to change that idea. We're using salmon for this recipe but you can choose any kind! 1. Put salmon filet on a towel or pat it dry. 3. 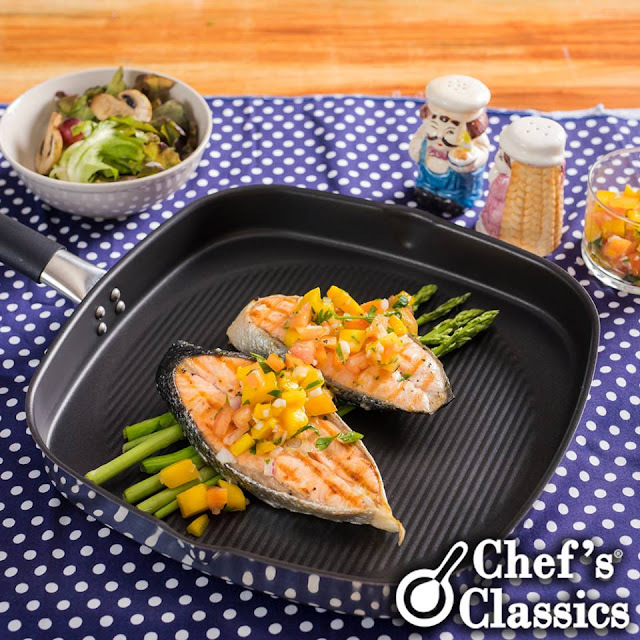 Heat Chef's Classics Lavender Grill Pan using medium to high heat. Add in olive oil and grill the salmon. 4. Give the first side a golden layer by grilling it for 30 seconds or a minute. 5. Flip salmon in the other side for lesser time. Don't overcook. Set aside on a plate with a paper towel. 6. For the salsa, mix mango, cilantro, tomato, a drizzle of olive oil, onion, chili and lemon juice. 7. Serve grilled salmon with the mango-tomato salsa and steamed rice.